Seeking Justice Through Religion and Human Rights? Photo credit: Neomi De Anda, Ph.D. 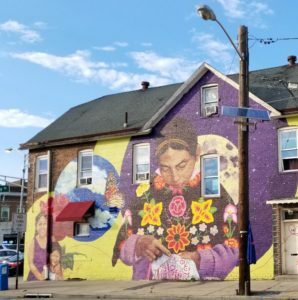 The Academy of Catholic Hispanic Theologians of the United States invites you to join us for our 2019 colloquium in Dayton, Ohio from June 2-5. This year, ACHTUS celebrates 30 years of colloquia and 5 women Presidents in a row. Over the last few years, ACHTUS colloquia have dealt with various social issues including LGBTQ+ rights, the prison industrial complex, and the environment. This year’s colloquium follows the Academy’s commitment to justice from the purview of LatinoXa scholars of religion, with particular attention to human rights and the various intricacies of what human rights may mean for our various communities. The registration fee is $125 which includes breakfast (high protein, low fat, and continental); snacks; lunch on Tuesday; banquet; shuttles (during designated times); and conference materials. a) You may bring guests to the banquet at $60 per person. b) You may choose use of the gym facilities for $24 for all days. RecPlex (gym) amenities found at this link. — Please note when you register, you must choose one from each of the meals you plan to attend. If a meal is not chosen, you may not have a meal. We will order a few extra vegan meals but cannot guarantee a meal, if you have not chosen one. a) Suites in Adele, the new residence hall on campus (up to 4 persons per suite). Most colloquium events will be heldin or near Adele hall. Register and pay for this housing through the registration link below in #4. You will need to have the names of your roommate(s) at the time of registration. b) Hotel rooms at the University of Dayton Marriott. Reserve your room at the Marriott at this link. The link should take you directly to the special rate. If not, please request the UD rate when initially making the reservation to receive the negotiated rate of $142.00/night plus taxes (13.25%). ACHTUS does not have a room block, so rooms will be available on a first-come-first-served basis. Reservations by April 1, 2019 are highly encouraged. — To register to the colloquium, please go to this link. If you begin the registration process but need to leave and return, make sure to use the password provided from Conference Services. Otherwise, you will not be able to continue the registration process. — If you need further assistance with registration, go to this link. Registration fees include shuttle service from and to the Dayton airport during designated times, breakfast, snacks, coffee and tea, and all meals on Tuesday.